Aquaman may have an important part to play. Director Zack Snyder recently released a short clip from the upcoming Justice League on twitter, giving the Internet a glimpse of Aquaman in action. While comic fans may know Aquaman as an interesting character with a complex mythology, one of the film's greater challenges will be convincing the general audience of this. This clip suggests that Aquaman will have a major role to play in Justice League, and beyond. The clip shows Aquaman swimming up to a figure on a throne, who some have speculated to be his half-brother Orm, also known as the supervillain Ocean Master. It is certainly possible, considering that Patrick Wilson was recently cast as Orm. However, reports indicated that Wilson was cast in 2018's Aquaman, with no indication he would appear in Justice League. He may appear in a previously unrevealed cameo, but there's also another problem with this theory: that figure doesn't really resemble Orm very strongly. 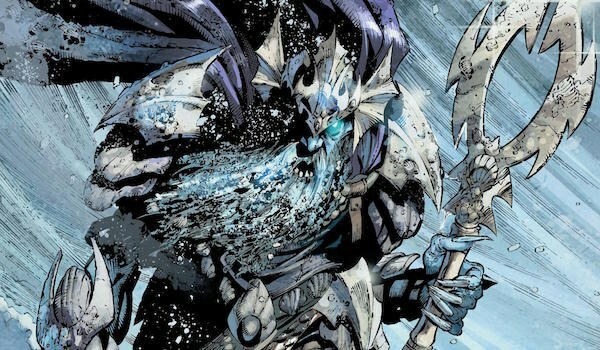 However, it does look quite a bit like The Dead King, a character introduced in Aquaman comics a few years ago. The Dead King, also known as Atlan, ruled Atlantis until he was betrayed by his brother, who started a dynasty to which Aquaman is the current heir. Naturally, the Dead King holds a bit of a grudge. The Dead King forged seven magical weapons to get his revenge. The most notable of these is Atlan's Sceptre, which can sink whole continents, as it did with Atlantis. These weapons were buried with the king in his tomb, which it seems Aquaman may be visiting in the new clip. The scepter may have already been stolen, or perhaps Aquaman is going to recover it for some reason. This may play an important role in Justice League, or form the basis of next year's Aquaman. Geoff Johns, the writer who created the Dead King, is serving as producer for all of DC's movies and co-writing Aquaman, so it's more than plausible that elements of his storylines could make it onto the big screen. Moreover, this storyline could be a good opportunity to re-shape Aquaman's public image as a useless hero. The scepter represents a clear threat to the entire world, giving Aquaman a good opportunity to prove his worth as a member of the Justice League. Justice League hits theaters on November 17th, while Aquaman is set for an October 5th release in 2018.